WASHINGTON, DC, July 7, 2011 (ENS) – Six new corporate partners, operating a total of nearly a million commercial vehicles across the United States, have joined the National Clean Fleets Partnership. The new partners include some of the largest U.S. corporations – Coca-Cola, Enterprise Holdings, General Electric, OSRAM SYLVANIA, Ryder, and Staples. They have already begun taking action to develop and implement fuel-efficiency projects in their fleets. The National Clean Fleets Partnership, announced by President Barack Obama in April, is a public-private partnership that helps large companies reduce diesel and gasoline use by bringing electric vehicles, alternative fuels, and fuel-saving measures into their daily operations. The Partnership furthers the Obama administration’s goal to cut U.S. oil imports by one-third by 2025. In addition to the new partners, the partnership includes charter members AT&T, FedEx, PepsiCo/Frito-Lay, United Parcel Service, and Verizon. Under the partnership, each company will work with the Energy Department to develop a comprehensive strategy to reduce petroleum and diesel fuel in their fleets. The agency helps to connect partners with clean fuel providers and equipment manufacturers where their fleets operate. 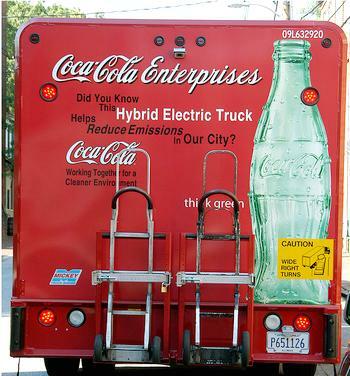 Coca-Cola, which has the largest hybrid delivery fleet in North America, has deployed hybrid delivery trucks and trained drivers in eco-driving techniques. The company expects to deploy additional hydraulic hybrid vehicles this year. Enterprise Holdings, which includes Enterprise Rent-A-Car, Alamo Car Rent A Car, National Car Rental, and WeCar, currently offers Chevrolet Volts and Nissan Leafs to consumers for rentals and expects to further expand its fleet. General Electric has committed to convert half of their global vehicle fleet and will partner with fleet customers to deploy a total of 25,000 electric vehicles by 2015. Ryder recently celebrated the opening of its first natural gas vehicle maintenance facility, which will deploy hundreds of heavy-duty liquefied natural gas trucks, include two LNG fueling stations and two additional maintenance facilities. This project is expected to save 1.5 million gallons of diesel fuel per year. Staples has increased the fuel economy of its fleet by more than 20 percent since 2007 through fuel-saving steps such as automatically limiting truck idling to no more than three minutes and limiting the top speed of its vehicles to 60 miles an hour. The company is in the process of testing all-electric delivery trucks in Ohio and California. OSRAM SYLVANIA aims to replace 10-12 percent of their fleet annually with more energy-efficient vehicles. This year, they will replace more than one-fifth of their utility trucks with more efficient ones that reduce the need for idling. The Department of Energy provides the partners with specialized resources, technical expertise, and support. Members benefit through opportunities for peer-to-peer information exchange, collaboration with DOE and national laboratories on research and development initiatives. Partners receive assistance in pursuing group purchasing so that smaller companies work with their larger peers to get the benefits of purchasing advanced vehicles in bulk. DOE offers technical tools to help partner companies navigate the world of alternative fuels and advanced vehicles. A diverse collection of cost calculators, interactive maps, customizable database searches, and mobile applications provide vital information and analysis to fleet operators.